‘Orphic’ Beard oil is a light oil with a fruity and mint scent with just a hint of Lavender, it was nice to use this oil as the sun appeared again as it has that fresh spring feel to it. The scent is very natural and not strong and in your face, after applying my hands smelt like I had run my hands through the mint and lavender plants that we have by our backdoor, a nice natural and fresh smell. I have enjoyed using this oil, it’s a pleasure to have its scent on my beard. 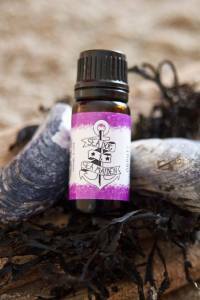 ‘Orphic’ Beard Oil from Sea Dog and Sea Maiden gave my beard a gentle hold and left it feeling soft. The oil comes in a 10ml glass bottle with a dropper and is available from the website for £5 or 2 bottles for £8.50. Sea Dog and Sea Maiden is the brainchild of Mark and Brenda and this is what they say about themselves and Sea Dog and Sea Maiden. I’m Mark. The bearded one. Let’s just say I’ve gone well past the itchy beard stage. I can’t remember the last time I stood with a razor in one hand and a dollop of shaving foam in the other. Having sported stubble for many years, I fancied a change and let the fuzz grow out. The realisation soon came that a beard needs more attention than I had anticipated. Finding the right oil or balm isn’t just about the brand. It might have a cool name and cool adverts but it needs to do what it’s needed for. A simple mix of natural and nourishing oils and a few drops of scent can keep your beard soft and kissable. That’s where we come in… though only with the soft beard thing, the kissing is up to you!!! Hi, I’m Brenda. I’m the real captain of this ship. Don’t worry. It’s not all beard talk at Sea Dog & Sea Maiden, (why should the guys have all of the fun), I’ll keep the female side up with a few other goodies. Winter months and the miserable weather bring dry skin and chapped lips. We’ve got you covered. Keep them soft and supple with some handy sized tins of our range of lip balms and some hand and body balms coming later in 2016. We take great pride in what we do, that’s why we personally hand craft each product ourselves in the seaside town of Bangor, Northern Ireland under the ever watchful eye of two very lazy dogs.